Snapshot: This article reviews some common tax issues from a nursing point of view, and provides advice about how to minimize your tax burden. Note: This article is intended for informational purposes only. Please consult a professional accountant to verify the information listed here. This article does not constitute an endorsement of or recommendation to pursue a particular tax strategy. What Is a Tax Deduction, and Why Does It Matter? Standard Deduction vs. Itemized Deduction What Miscellaneous Expenses Can I Deduct? What Is a Tax Deduction, and Why Does It Matter? A tax deduction is money that you can subtract from your earned income, thereby reducing the income on which you are taxed and the amount of tax that you will owe. There are numerous nursing-related tax deductions that some nurses may benefit from using; these are outlined in the sections below. Important note: Every individual’s financial situation is different, and this article is not meant to substitute for professional tax advice. Before claiming any deductions or otherwise acting upon the information provided here, please consult with a Certified Public Accountant (CPA), enrolled agent, or other tax professional. Before you can claim any nursing-related tax deductions, the first question you need to answer is this: are you better off taking the so-called standard deduction, or are you better off itemizing your deductions? (You have to choose one or the other; you can’t choose both methods within the same tax year). If you take the standard deduction, you will not be able to claim the specific nursing-related tax deductions outlined in the next section (“What Can I Deduct?”). You therefore need to first determine which type of deduction will save you more money. Itemizing your deductions, in contrast, means adding up a series of deductions that are permitted to claim under the tax code and subtracting this total amount from your adjusted gross income (AGI). Your adjusted gross income is the amount on Form 1040, line 38. Various miscellaneous expenses that exceed 2% of your adjusted gross income (you can’t deduct any miscellaneous expenses until they exceed this 2% threshold; see the sub-section “What Miscellaneous Expenses Can I Deduct?” below to learn more about nursing- and non-nursing-related expenses that you may be able to claim if you itemize your deductions). If you add up the above deductions and they exceed the amount of money you’re eligible for under the standard deduction, you should strongly consider itemizing your deductions. Note: Especially for new homeowners, who pay most of their monthly mortgage payments in the form of interest, it doesn’t take much to exceed the amounts you’re eligible for under the standard deduction. Consider that even if just $800 of each mortgage payment goes towards mortgage interest you’re up to a $9,600 deduction, and if your annual property taxes are around $2,000 you’re already at $11,600, which is just above the standard tax deduction for a married couple filing jointly. That doesn’t even take into account any other itemized tax deductions you may have. You obviously must be able to substantiate any deductions you claim with receipts, bank statements, credit card statements, canceled checks, etc. To itemize, follow this philosophy: “save it today, file it away.” If you get audited for some reason, you will need to prove the veracity of the deductions that you claim. Your tax filing status may affect your decision. For example, married couples who file separately must decide together which type of deduction to take. Even though each individual will file a separate tax return, if one spouse decides to take the standard deduction (or decides to itemize), the other spouse must do the same. Consider that you can change your mind year-to-year. That is, you can take the standard deduction one year, and the next year (for example, if your financial situation changes), you can then decide to itemize your deductions. The standard deduction is obviously a bit easier (i.e. less hassle) because it’s a fixed number each year, and all you have to do is write it down on your tax form (form 1040). Many tax preparation software packages, such as TurboTax, have built-in features that can help you decide which deduction method (standard deduction or itemizing your deductions) will save you more money. Professional tax advisors can also assist you with this decision. Both approaches to deductions can be found on all standard U.S. personal income tax forms. The standard deduction can be taken on Forms 1040, 1040A, or 1040EZ. (Note: If you qualify for the higher standard deduction for new motor vehicle taxes or a net disaster loss, you must attach Schedule L). 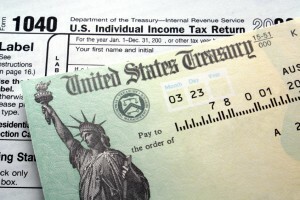 To itemize your deductions, use Form 1040, U.S. Individual Income Tax Return, and Schedule A, Itemized Deductions. Personal income tax forms and instructions may be downloaded from the IRS website at www.irs.gov or can be ordered by calling 1-800-TAX-FORM (1-800-829-3676). What Miscellaneous Expenses Can I Deduct? If you decide to itemize your deductions, there are a variety of nursing- and non-nursing related miscellaneous expenses that you can deduct from your adjusted gross income to lower your tax bill. One big caveat is this: to deduct these expenses, they must be equal to or greater than 2% of your adjusted gross income. Moreover, only expenses above this 2% “floor” are tax-deductible. For example, if your adjusted gross income for the current tax year is $50,000, you could only deduct ‘miscellaneous expenses’ (including some nursing-related career expenses) that exceed $1,000, since 2% of your $50,000 income = $1,000. So, if you had $1,500 in miscellaneous expenses (including nursing-related career expenses), $500 of these expenses would be tax-deductible. The good news is this: if you’re itemizing your deductions, you can add any of these tax-deductible expenses (i.e. those over the 2% “floor” of your adjusted gross income threshold) to all of the other expenses you’re allowed to deduct. Unreimbursed work-related expenses, such as travel or education (so long as the education does not qualify the taxpayer for a new line of work; law school, for example, is not deductible). Note: You can deduct the cost of transportation to go to interviews, cost of preparing a resume, cost of fax machines, interview books and guide, and mailing costs. If a new job is more than 50 miles farther away from your old house than your old job was, then you can deduct the cost of getting yourself, your family and your positions to the new location. You can claim this tax saver regardless of whether you itemize deductions, so it is not subject to the 2% rule. Note: Unreimbursed commuting expenses, either by car or mass transit, generally aren’t tax-deductible – not even if you’re conducting business via your hands-free cellphone in transit. When you use your vehicle to attend meetings, meet clients, run business errands, attend training or conferences for your employer, you may be able to deduct the cost of the mileage driven and parking fees. The most mileage reimbursement rate is about 52 cents per mile. So if you drove 100 miles for your employer, then you can deduct as much as $52 on your return. The caveat is to make sure that you keep proper mileage log. Keep in mind that commuting (mileage to and from work) costs are not tax deductible.